Trio of Team USA players, Des Moines' James Durham earn weekly honors. The United States Hockey League announced the Forward, Defenseman and Goaltender of the Week for Week 25 of the 2018-19 season. 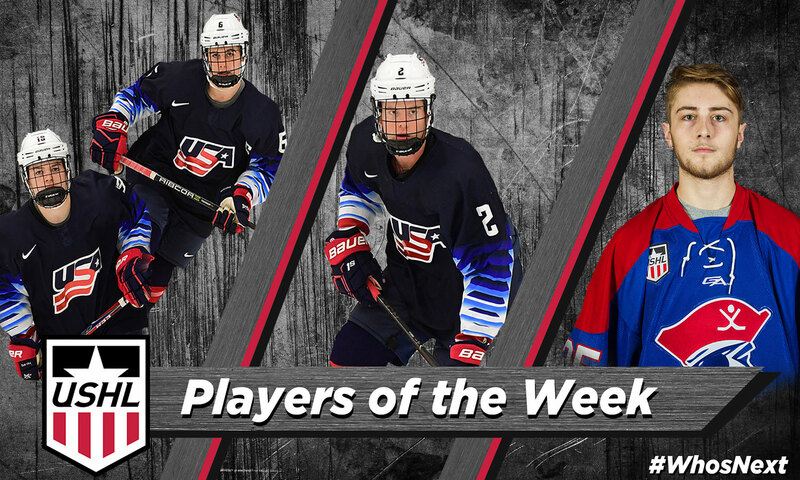 Team USA forwards and top 2019 NHL Draft prospects Jack Hughes and Cole Caufield were named Co-Forwards of the Week, their teammate Cam York earned Defenseman of the Week honors for the second time this year and Des Moines Buccaneers goaltender James Durham was named Goaltender of the Week for the first time in his USHL career. Hughes and Caufield combined for 17 points over the weekend, including a six-goal game from Caufield and a five-assist game from Hughes on Friday. York dished out three helpers on Friday and added a goal and two more assists on Saturday, and Durham stopped all 10 shots he faced in relief on Friday before stopping 33 of the 34 shots he faced on Saturday to lead Des Moines to a victory over Eastern Conference-leading Muskegon. The USHL is America’s only Tier 1 junior hockey league, and continues to lead the world in the advancement of Division I college hockey athletes. Hughes dished out five assists in Team USA's 12-4 victory over Green Bay on Friday before scoring a goal and adding three more helpers on Saturday to lead Team USA to a 13-1 win and weekend sweep of the Gamblers. With his nine-point weekend, Hughes is now the all-time leading scorer in Team USA history. The projected top pick in the 2019 NHL Draft has now earned Forward of the Week honors in back-to-back weeks and is up to 40 points (10G, 30A) in just 20 games this season, an average of two points per game. His 40 points lead all Team USA players, as do his 30 assists. His 30 assists are also good for 13th among all USHL players, despite him having played in about half the amount of games. Hughes is now in the midst of a 10-game point streak dating back to Jan. 15, with 25 points (9G, 16A) in that span to go along with a +18 rating. He has only gone without a point in two of his 20 USHL games this season and has recorded multiple points in four straight games and 13 games overall. 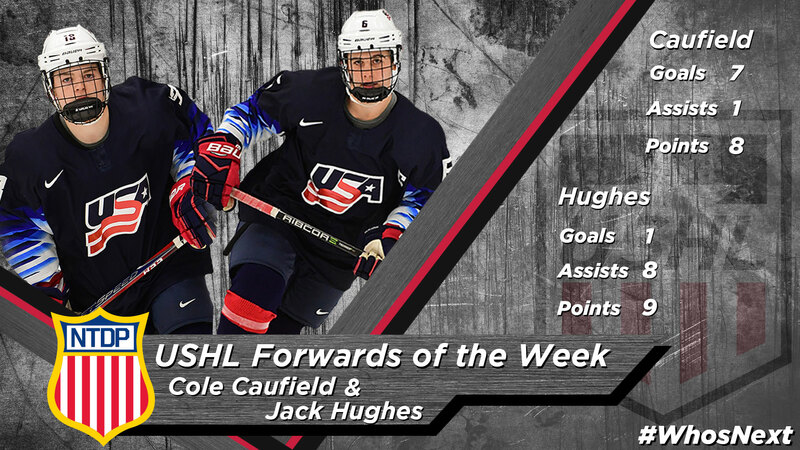 This is Hughes' four weekly award of his USHL career, as he was previously named Forward of the Week on Jan. 22, 2018, Mar. 12, 2018 and Mar. 18, 2019. He was listed as an A-rated skater on both the NHL Central Scouting Preliminary and Updated Players to Watch List, and was then ranked first overall among North American skaters on January's NHL Central Scouting Midterm Rankings. Hughes is in his second season in the USHL and had an incredible first USHL campaign, as he recorded 54 points (21G, 33A) in just 27 games to help Team USA to the Clark Cup Playoffs for the first time since the 2011-12 season. Prior to his time in the USHL, Hughes skated for the Toronto Marlboros. Caufield found the back of the net a whopping six times on Friday, and added an assist, in Team USA's win over Green Bay on Saturday and scored his seventh goal of the weekend on Saturday against the game. His seven-point performance on Friday's tied Team USA's record for most points in a game, a record set by defenseman Cam York on Jan. 15. The University of Wisconsin commit also set a Team USA over the weekend, as he now holds the all-time record for most goals in program history. In his 24 games, this season, Caufield has recorded 39 points (27G, 12A) in 40 points, placing him second behind only Jack Hughes in team scoring. His 27 goals lead the team and are more the double the numbers of goals as Matt Boldy, who sits second on Team USA in goals with 13. Dating back to Jan. 15, Caufield is second among all USHL players in scoring, behind only teammate Alex Turcotte, with 27 points (19G, 8A) in just 13 games. His 19 goals in that span lead all USHL players, and he has recorded six multi-point performances in those 13 contests. A native of Stevens Point, WI, Caufield burst onto the USHL scene last season in his first year with Team USA, recording 33 points (23G, 10A) in 32 games to help Team USA to the Clark Cup Playoffs for the first time since 2011-12. He is considered a top prospect for the 2019 NHL Draft, as he was listed as an A-rated skater on both the NHL Central Scouting Preliminary and Updated Players to Watch List, and was then ranked 15th among North American skaters on the NHL Central Scouting Midterm Rankings. Prior to his time with Team USA, Caufield skated for Team Wisconsin and Stevens Point Area High. Just like his forward teammates, York had himself a productive two games over the weekend. He dished out three assists on Friday before scoring his fifth goal of the season and adding two more helpers to help Team USA solidify their positioning in the Eastern Conference standings. He has now scored in three of his last four games dating back to Mar. 8, with a goal, six assists and a pair of multi-point efforts during that stretch. Dating back to Jan. 15, York is the third-leading scorer among USHL defenseman, with 19 points (5G, 14A) in just 13 games. Overall, York has registered 26 points (5G, 21A) in 24 games, good for seventh on the team in scoring. He leads all Team USA defenseman with his 21 assists and is second among NTDP blueliners with his five games. 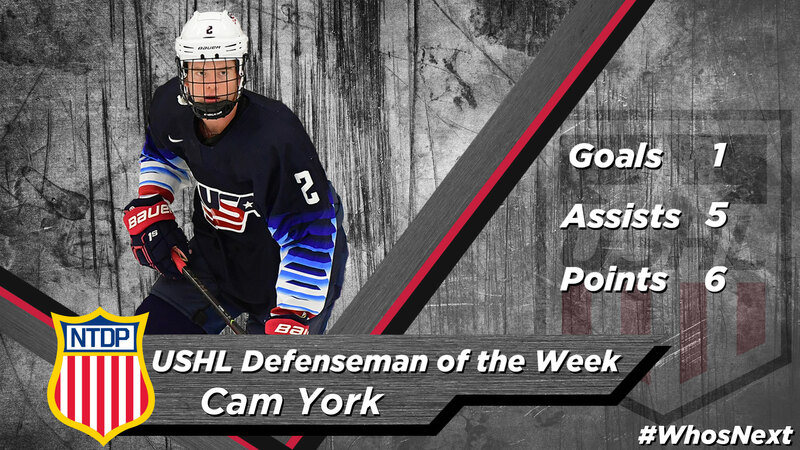 York is in his second USHL season and put up seven points on Jan. 15 against the Youngstown Phantoms, tied with Caufield for the most points by any player in Team USA history. He recorded 14 points (3G, 11A) in 33 games with Team USA in 2017-18 and is ranked 12th among North American skaters on the NHL Central Scouting Midterm Rankings ahead of the 2019 NHL Draft. York is a native of Anaheim Hills, CA and previously played with Shattuck-St. Mary's. 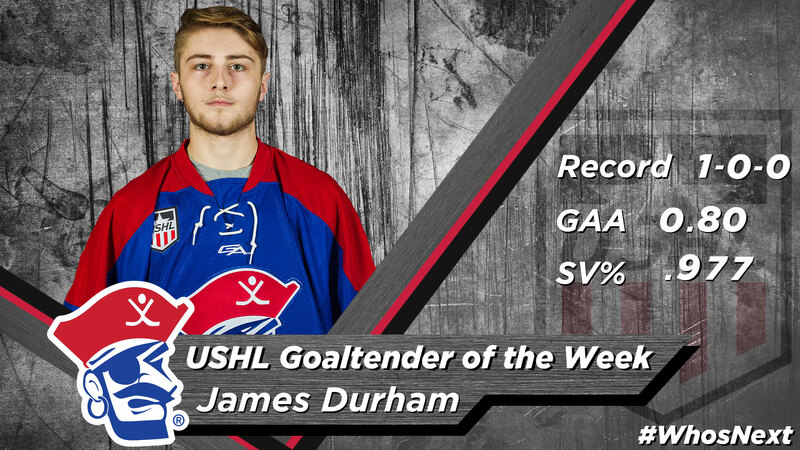 Durham stopped all 10 shots he faced in relief against Muskegon on Friday before turning aside 33 of the 34 shots he faced on Saturday to lead Des Moines to a 3-1 victory over the Eastern Conference-leading Lumberjacks on Saturday. The Grand Rapids, MI native has now won each of his last two starts and now boasts a record of 5-2-1-3 to go along with a 2.46 GAA and .918 SV%. He has earned the Buccaneers at least one point in nine of his 15 appearances this season and has allowed two goals or fewer in nine of his last 11 appearances dating back to Dec. 14. This is Durham's first career USHL weekly award. He is in his second USHL season and spent the 2017-18 campaign with the Dubuque Fighting Saints, posting a 3-3-1-1 record in 12 appearances. In 27 career USHL games, he has an 8-5-2-4 record, a 2.95 GAA and .907 SV%. Durham was acquired by Des Moines from Dubuque on May 17, 2018 and played for the Shreveport Mudbugs (NAHL), Honeybaked and Meijer AAA prior to his time in the USHL.